Hiya, how are you? the weekend is nearly gone. They come round fast and they go past even faster is hard to believe that is September already. I am soo busy trying to get ready for the Great Northen Papercraft Show in Harrogate on the 11-12 Sept. that I haven't got anything new to show you but the retired list provided me with a reason to go search my blog for examples of those sets that will be no more from Oct. 1st. Like you I do have my absolute favourites and is these sets I will concentrate on, those I would really miss. And I have to say that Bloomin With Beauty is up there with my favourite sets of all times, I am really SAD this one is going. So I will share some of the cards I made with this lovely, lovely set. 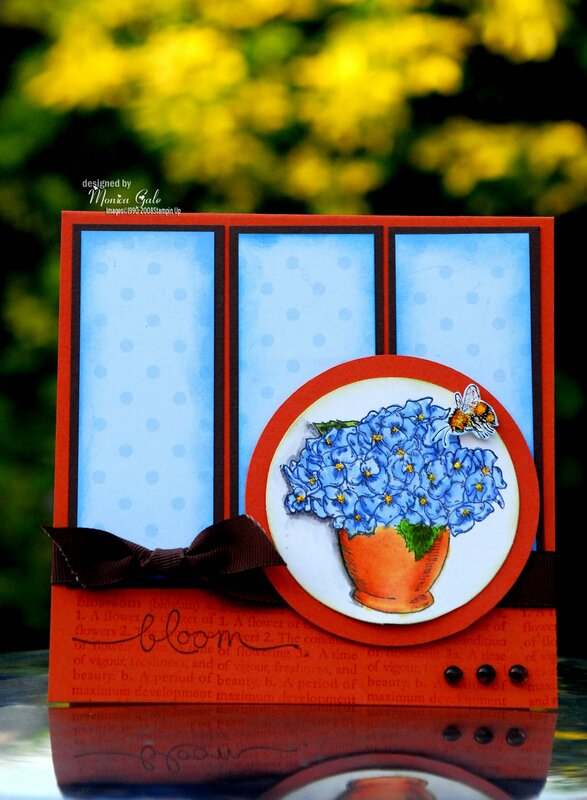 Really Rust, Chocolate Chip and Bashful Blue, the flowers and pot were coloured using markers. 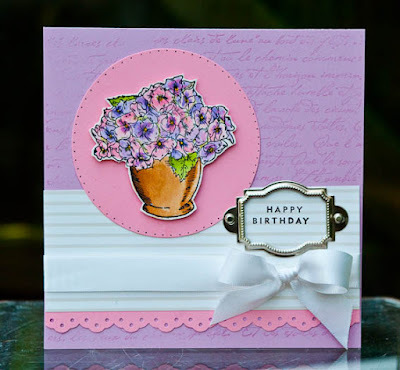 Such a gorgeous combo and I quite love the layout too, I am sure it was one borrowed from Splitcoast Stampers. 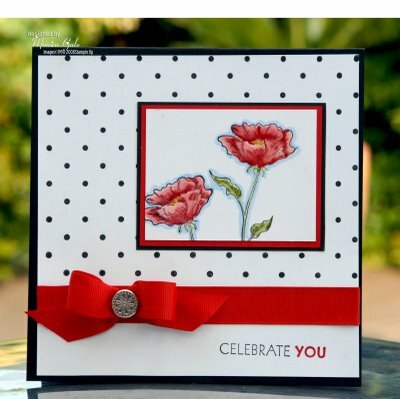 Basic Black, Real Red and you can also spot the spotty Polka Dot background stamp also retiring. Next a vision of pinks and lilacs. Next a simple sympathy card, I love the bright colour even if is for a sombre occasion. 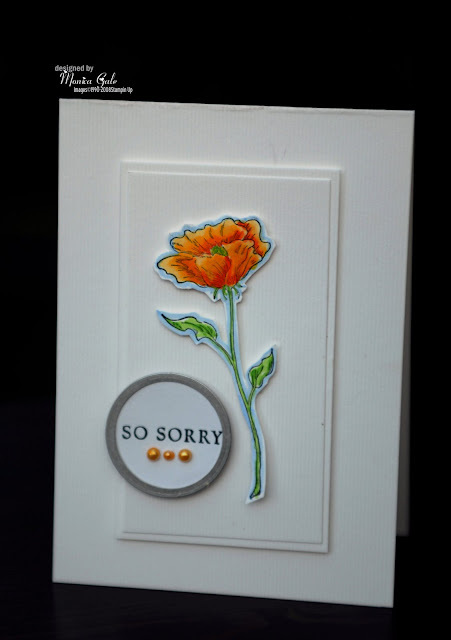 Sympathy cards are always so hard to make. This gorgeous image combined with a lovely paper pleating skirt. Always Artichoke, So Saffron and Pretty in Pink. Blush Blossom, Ruby Red and Chocolate Chip. 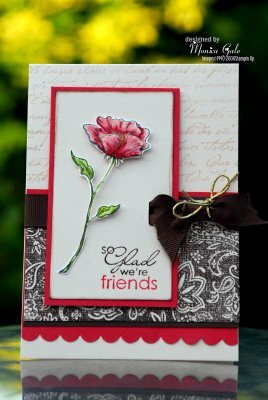 I have also used the Paisley background stamped in chocolate over Blush Blossom. I hope you enjoyed my trip down Memory Lane with this pretty stamp set, is certainly one to have in your collection and if you fancy it after seeing those lovely examples email me and I will get my skates on and order it for you. I wanted to tell you that already we are running low on some stock and I can confirm that SAGE SHADOW Card Stock and CLOSE TO COCOA card stock have gone out of stock. ORDER 4 PACKS of card stock and get the 5th FREE. It doesn't have to be retiring card stock and you will get the cheapest one FREE, postage is £3.95 or 5%(whichever is higher) of total order value. I have also added a Paypal button to preorder your own copy of the NEW catalogue. I am awaiting a humongous pile of them and you can now preorder your copy for only £3.99 including postage ( retail price is £5.95). I understand this is a rather tempting time with lots of pennies to be spent so again I am making sure I offer you my loyal blog readers and customers a sweeter deal. Click below to order your copy today. Such gorgeous cards Monica, I too am really upset that Bloomin with Beauty is retiring its a fabulous set, each one is a masterpiece I couldn't chose a favourite! I can't believe I'm going to miss you at the Great Northern PC Show! would you believe I'm going to be 'up North' again in September and in Harrogate, but a fortnight after!! 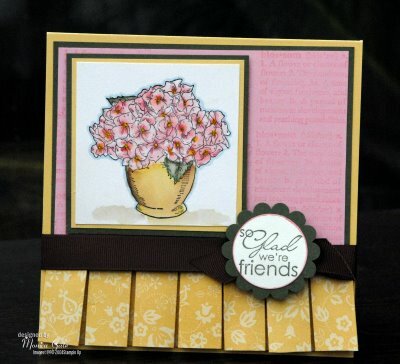 Lovely cards Monica - love the flower stamp and looks great coloured in so many different colours. Monica, I wanted to get in touch to ask you whether Stampin Up did a cardstock colour that you would say was a similar colour to Tiffany & Co blue/green that they are famous for using. I really love the colour and wanted to know if they do it. Please would you let me know. thanks for the reminder of all the lovely cards to be made with this set.